If “content is king” then the crown jewels are visual content. The last time you were scrolling through your favorite social media channel, what made you stop in your tracks? Odds are it was a stunning visual that made you pause, think and react. In the social media world, good visual content is marketing gold. Like a good first impression, an image that is on-point and attractive makes us want to know more. It draws us in and can be the key to starting a relationship with our target customer. It can illustrate how we are alike and how we have the same pains, questions, and needs. It will help you shine the best light on your product or service while engaging your clients. It humanizes your brand, turning prospects into friends. You see, we are imaginative beings. Good visual content is emotional and compelling. It tells a story, sometimes without saying a word. It draws the reader in and, when done well, encourages the reader to share the message. Images that are “share-worthy” will help spread your marketing message to the masses in a viral way. Visual content can earn big returns for relatively little effort. An image that takes mere minutes to create that is shared on social media, can gain exposure for your brand’s message like nothing else can. 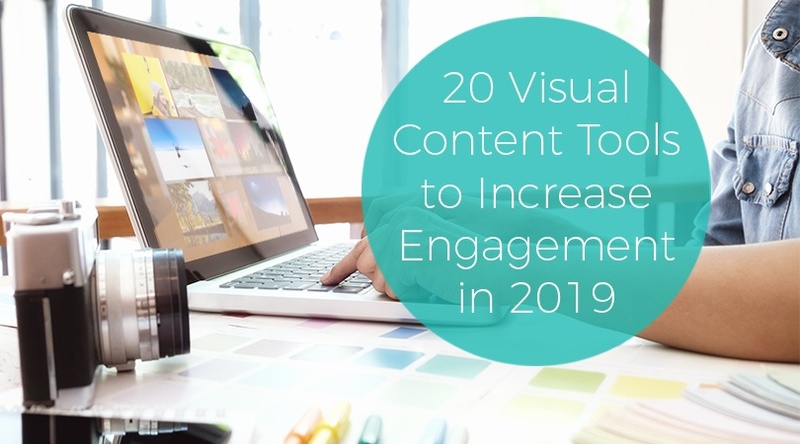 Incorporate strong visual content into your marketing assets, and you’ll not only reach new customers but learn about what appeals to them as well. Ready to up your visual content game? Try using these tools to create content that will connect with your customers. We’ve broken the list into three categories, image design resources, infographic tools, and GIF creation tools. This list doesn’t include video creation tools. However, you can find information about video marketing tools in a separate article. Anyone can become a graphic designer with the tools available today, so there is no excuse to not include visual content in your digital marketing. Give these free tools a try. Infographics allow data to tell a story. They are one of the most-shared types of images on social media and are especially helpful for businesses that want to present complex ideas in a visually compelling way. Add infographics into your visual content strategy to build brand awareness. Think GIFs are only for sharing pop culture trends? Think again. Businesses are using GIFs to engage with their customer base because they are easier to create than video and get a message across quickly. Adding in a bit of humor helps engage your audience, positioning your business as having a pulse on today’s consumers. So, there you have it - a list of easy-to-use tools to add to your visual content creation arsenal. Now, go inspire your social media niche with your message and create connections that convert! Original publication date April 7, 2016. Updated December 7, 2018.